In the last post I show how to set up a specific page to be the landing page for showing help text for any page in the application. 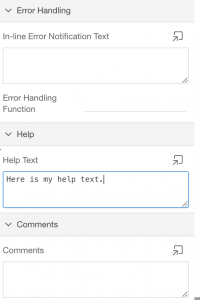 In this post I’ll show how to get help text displayed inline with a page the user is on. It is often preferable to be able to see the help on the page you want to know how it works. If you have it on another page like I showed in the last post, you often end up going there reading a bit and then go back to look only to repeat that a number of times. What if you could see the help on the page you’re on? Sometimes that is much better. The basis for this is using the global page to have a halp region be available on every page in the application (unless you restrict it). Create a global page if you do not have one in your application. Then add a “help text region” to the Content body of the global page. Name it “Info” and a sequence of 0 to make sure it is the very first region in the content body. If you run the application now, every page shows the help text for it’s page. So it is already working, but we want the user to select when it is to be displayed. We will use a page item to define when the help is shown and when it is not. Lets create a page item “AI_SHOW_HELP” to let us control when help is shown. 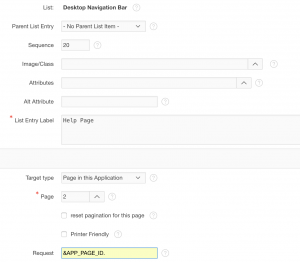 To make sure the application shows with help not being displayed, we’ll set up an application computation to default the application item to N.
With the Application Item in place and dafaulting it to not show help, we just need to set the condition on the help text region on the global page to only show when AI_SHOW_HELP has a value different from N. To make sure it is only shown when we have requrésted it, we check for it being Y rather than just not being N.
If you now run the application, the help will no longer show on any of your pages. The reason is of course that we default AI_SHOW_HELP to “N” while only showing the help text when it is set to “Y” without any means to set it to “Y”. The way to create a toggle in the navigation bar is to have two entries and only show the one the reverses the current selection, i.e. if AI_SHOW_HELP is “Y” then let it be “N” and vice versa. Head back to shared components and click on “Navigation Bar List”, and click on “Navigation Bar List” in the report to go to editing the entries in the navigation bar. Now we have a navigation bar entry (high up right where the logout link is) that toggles help on and that is only shown when help is not shown. Run the application and click “Show Help” in the navigation bar to see the inline help being visible again. There is then – yet – no means to turn off the help. Now that it works we need to create one more entry that does the reverse. It is shown when help is visible to allow the user to hide the help again. Return to the edit window and lets set up a reverse navigation bar entry of the one we just created. The easy way to do it is to click the copy icon on the right side on the row for “Show Help”. Do that and enter the following values. Now lets edit the few things we need. Click “Hide Help” in the report over navigation bar entries. That is it, the application now has a toggle between Show Help and Hide Help to toggle showing help about pages inline in the application. Note that it is an application wide setting, so once on it remains active until the user turns it off. Thus, if you turn it on and move around in the application, the help will show on every page until you decide to turn it off and not show help anymore. As I said in the last post I have set up a demo-app I’ll use to show the effects when I blog about things APEX where it makes sense to have a an app to show the feature. For the above, take a look at it. Log in with demo/demo. 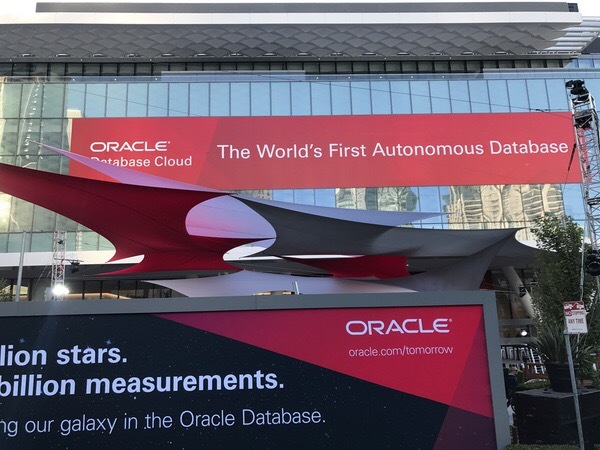 Every year there is talk about how Oracle needs to return to data and databases. Now that they do, I think we should be very happy even if we suspect the actual feature isn’t what we would have requested. Any day Oracle talks about database is a day they’re not spending on forgetting it. So I subscribe to the idea that the only way to improve is to dive in on the deep end. Sink or swim. With that in mind I sent in an abstract to RMOUG and actually got it accepted. Now, this is a conference I used to attend every year when I lived in Denver. I know the quality they have in most presentations nad I know that lots of people with “important” names in the community attends. I have to up my game and give myself a chance to be embarrassed. It scares and motivates me in equal amounts. Talking about that feeling, I watched the quick presentation at the OOW 2016 – “EOUC Database ACES Share Their Favorite Database Things”. I was impressed by how they managed to keep those presentations to just five minutes and still get a great message across. I figured that would be a great thing to practice. I’m going to the DOAG conference in a week and before it starts there is a day for user group leaders. I’ll attend that and on the agenda there is a 30-minute slot with 4-minute presentations. Even less than they gave the ACED presenters at OOW. Not really knowing what I’m getting myself into, I tossed my name into that ring also. Hopefully I get to make a try at that too. There will be just a few days of prep. Maybe that is just as well so I do not find time to chicken out. Standing in front of all the group leaders in Europe with just a couple of evenings to prep will be nerve-wracking. But again, if one wants to improve, one has to test those wings. Hopefully I’ll get through those without too many scars. I look forward tremendously to both conferences for the meetings as well as for the chance at possibly present at both conferences. Time to get back into blogging. I stopped a while ago and the reason was two-fold. As I was leaving my job at Kentor AB I wanted to avoid any concerns with what I wrote while my three month long two week notice played out. The other reason was that once I had left life got really busy both with work for my client as well as with the new adventure I had departed on. The new adventure is to bring the Miracle brand to Sweden. I will try to build up an Oracle database focused team here in Stockholm based on the success Miracle A/S has had in Denmark. Yes it is equally exciting as it is scary for someone who has lived their life in medium to large scale consulting practices. However, I have always had a big admiration for the guys who started Miracle and what they have achieved. Getting a chance to bring the same style and quality to my home market of Stockolm and Sweden was just an offer that was too good to pass up. That is the kind of opportunities most of us will only get once or twice in a career. This one came at a time where it was close enough to work with everything else that was going on. The one thing that may not be optimal is having a new house built at the same time. Actually, that makes it completely not optimal. But the phrase I keep repeating to others that are thinking about when the best time to get started is “There is no time such as the present”, so I took my own advice for once. So now the work is on getting the Oracle practice going, or rather it is going it just needs a few more legs. And with legs I mean consultants. This blog will soon return to a more technical program. thought probably with some posts on interesting things with starting up a company. I’m sure the next year will teach us a lot of things on how to do that. About that, this hiring business… When is the best time to add more people to a small company and how do we manage risk? Well… ehhh… Yeah… That’s right there is no best time, but there is no time such as the present. I have hidden my previous post on the explicit request by Oracle Security Team. If you did read it or have it in your RSS, please do not forward or talk about it online until further notice. I’m not sure it is the right thing to do, but I have promised Oracle to not publish it for now. Please help me keep that promise.